The Wealth Wheel is a one of a kind method that distills my personal experience into a few simple steps. Is effort required? Of course. But I am convinced that you can find success if you stay consistent. After finding a way to earn and save some extra money (and to reduce your expenses) you will be ready to invest in your first cash-producing asset. Wealth Wheel Step #3: Invest in a cash-producing asset. While the eventual goal will be to buy a Forever Cash asset, you might have to start out with something simpler, like selling land with financing (Temporary Cash). Can it create passive income? Can I do this remotely? Can it be done part-time? Remember: truly wealthy people live from the ongoing (forever) cash flow that their investments provide for them. They focus on creating such investments and then keeping them, preferably forever. 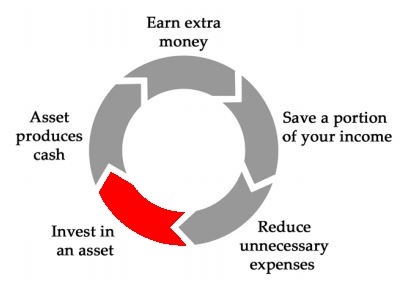 So if you want to complete this step of the Wealth Wheel and be financially successful, you must learn how to invest (chapter 13 of my book Forever Cash can help you with that part). After purchasing a cash producing asset, take the money that it spits out and put it into your special seed money bank account (along with your extra earnings, percentage of your salary, and money saved by reducing expenses). Then prepare to do it all again. Tomorrow I’m going to take a break from explaining the Wealth Wheel so that I can talk a little about listing properties on eBay. Then on Friday I’ll talk about how to speed up the Wealth Wheel process.